OK, so when I was a youngster, back in the late 1970s, I had “Grover-fever” something fierce. 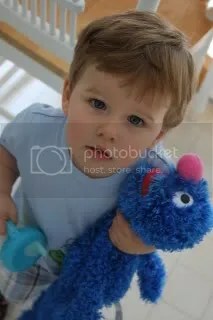 I just loved Grover from “Sesame Street.” Everywhere I went, I would drag my Grover doll around with me. So it excited me to no end when I went to Babies R Us with my mom last weekend, and we perused the toy aisle and saw a really nice Grover on the shelf. What a rarity that was. Usually, it’s all Elmo, all the time. In fact, I think they had about two dozen Elmo toys and just the one Grover doll. Oliver had a field day looking at all the toys. And with very little prompting (I swear), we let him pick out a new toy. And guess what? He picked the Grover! Pretty cool, at least to me. And now it’s one of the three stuffed “animals” (or monsters – whatever!) that he drags around with him. (The other two are Elmo – of course – and what I call his Jesus Lamb.) We’ve already taken Grover around the neighborhood on walks, taken him to the store, etc. We’ve recently started letting Oliver watch TV, though he’s probably only viewed about 10 hours total in his life to date. 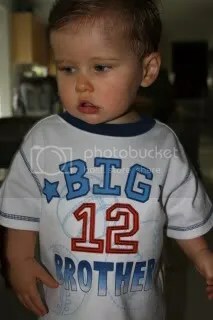 But one of the shows we, as his parents, can stand watching is “Sesame Street.” It really brings us back, and we like the fact that the show actually does research to prove that it helps children learn. I will say, however, that the show has changed quite a bit and it’s not all good from what I’ve seen so far. We’ll still give it a chance. I’ve been thinking a lot lately about my life in terms of chapters. The next big one, of course, will be the arrival of our second child early next year. Well, another major chapter just ended as well. Yesterday was Sarah’s last day at her job. As some of you know, her company was bought out earlier this year. Since that time, she’s been a contract/transitional employee for the new company. The contracts all ended yesterday. Now, Sarah is pregnant and jobless. We’re a one-income family. It’s not as if we haven’t prepared or are worried at all. We should be fine, but it will definitely mean big changes for the family. There will be job searches/interviews, after-work meals (a man can hope, can’t he! ), more personal attention for our son, etc. This new chapter officially will start on Monday, when I head off to work around 7 a.m. Wish us luck. OK, so it was a little bit uncool for me to post the picture of Oliver last night and leave my “dozen or so” readers hanging (missed that post, check it out here). Here’s the big news: My wife is pregnant with our second child. Yes, preggers. Bun in the oven. Baby on board. Hard to believe it, but my sweet Sarah is incubating another little Lopinot. It’s quite difficult to describe how I’m feeling right now. Was this pregnancy planned? Uhh, heck no. It totally caught us off guard. But are we excited about it? You bet. For those who really know us well, you’re aware of just how much we wanted and tried and tried and tried again to have our first child. We didn’t think No. 2 would come along this easy. In fact, we had scheduled a consultation with one of the doctors who really helped us along the last go-round. That appointment would have been this week or next, I believe. And that appointment would have been just the first step in what could have been a long waiting period filled with lots of heartache. However, we got lucky — hit the lotto without really playing, so to speak. Our first child has been such a wonderful baby, other than some sleeping issues over his first seven months (long-time readers, friends and family know how tiring that was on us!). And he’s really coming into his own now, developing such a sweet, fun personality. He loves wrestling and laughing with me as much as he loves giving me a big hug and putting his head on my shoulder. I know for a fact that he’s going to absolutely love his little brother or sister. As much as I cannot fathom how exhausting it will be to go through the “parenting-an-infant” stage again, it also excites me to no end that Oliver will have a little buddy to grow up with, play with, be in each other’s weddings and on and on. So here we are, a happy family with another one on the way. Thank you all (and though I joke, I do get about 70-100 unique visitors a day so there ARE a lot of you) for being so supportive as I’ve chronicled the past two years of my life on this blog. And thank you for also joining us on this new pregnancy journey. It’s such a relief to finally be able to openly talk about the pregnancy. We’ve known since the first week, and it’s been a looooooong two-plus months. Anyway, I’ll have more — lots more — to say about this in the coming days, weeks and months. Talk to you all again soon! Oliver’s new shirt: A fashion statement or a sign of things to come? My wife and I generally split up “diaper duty” 50-50. However, this weekend it was more like 100-100. Confused? What I’m trying to say is that it’s taken both of us for each diaper change. You see, Oliver came down with something that has caused some MAJOR diaper damage. And that, in turn, has caused some MAJOR blistering on his, ahem, private areas. And those blisters, when in contact with a wipe, cause some MAJOR PAIN, as evidenced by the boy screaming, crying and flailing his arms and legs. Yesterday alone, we changed eight straight diapers that must have weighed a pound apiece. Nasty, nasty stuff, too. This morning, we found Oliver in his crib with some MAJOR diaper leakage. The stuff was all over his arms and legs. Very gross. Let’s just say we had to give the crib a full and thorough scrubbing today. We will leave it at that. The diaper changes have become a tiring routine. One of us handles the diaper and one of us holds the boy’s arms and legs and tries to get him to laugh. Per our call with one of those doctor help lines, we have been rinsing the wipes before using them, putting neosporin on the tender spots and petroleum jelly all over the rest of his bum, giving him several baths a day in a mixture of water and baking soda, and making sure he gets lots of water. Things were a little better today. Several diapers featured only our favorite potty number (No. 1 – urine!). And at least Oliver has a good sense of humor about the diaper damage. When I question him with, “Did you poop?,” he says, “Ssssss-tink,” and flashes a huge smile. And when I repeat back to him, “You stink,” he giggles like crazy. Oh, the joys of parenting. What wouldn’t we do for this kid?